Thank you for taking the time to visit The Aerie Ballroom. Our historic events facility is available year-round to host your wedding, banquet, dance, business meeting, class reunion and more. We can accommodate groups of up to 300 guests. The Aerie Ballroom is conveniently located off I-5 exactly halfway between Seattle and Portland. 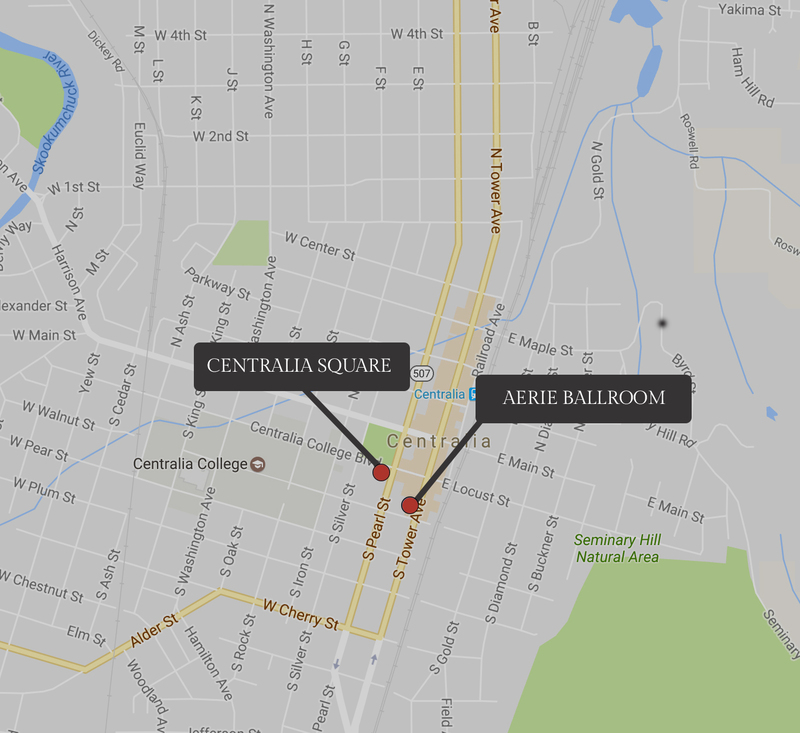 We are nestled in Historic Downtown Centralia near beautiful George Washington Park and our Centralia Square Grand Ballroom and Hotel. The continuing restoration of these two historic buildings is funded in large part by your events. The Aerie Ballroom is a family owned business. We are dedicated to making your special event a success! The Aerie Ballroom makes a great event location. In addition to the spacious Grand Ballroom, The Aerie also offers our Wine Bar Banquet Hall featuring an antique cherrywood back bar. The Studio Room provides smaller groups with a convenient kitchenette. The two room VIP Suite offers the ideal location to get ready for your big event in comfort and privacy. This place is amazing. The bar is beautiful and the venue is very spacious. Two rooms upstairs to get ready, a mirrored room to take beautiful pictures and later put your buffet in and a huge ballroom for the ceremony. The ballroom is beautiful with it's draperies and wood details and is very nicely decorated throughout, especially in the bride and groom suites. Great price and absolutely stunning! We couldn't have chosen a better venue! The first time we saw the ballroom we knew that was the place we wanted to have our wedding. The owners were great and so helpful the day of the wedding. After entering the venue, you forget that you are even in downtown Centralia and you are swept away into the 1920's with the original hardwood floor and beautiful drapings across the ceiling. I would definitely recommend anyone to have their wedding here! The value is wonderful, the place is beautiful and I would recommend it to anyone looking for a wedding venue. Thank you Neil and Jodi!! This is the perfect wedding venue for anyone who wants high-class vintage charm without paying big city prices. The Aerie was absolutely perfect. When my fiance and I went to look at it, we knew as soon as we walked in that it was the perfect place for us to hold our special day.